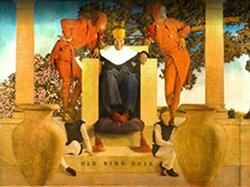 I now present a tour of some of the best places to go drinking like a Mad Man (or woman). Bill’s Food & Drink: It’s not exactly the original Bill’s Gay Nineties, but it’s pretty close. 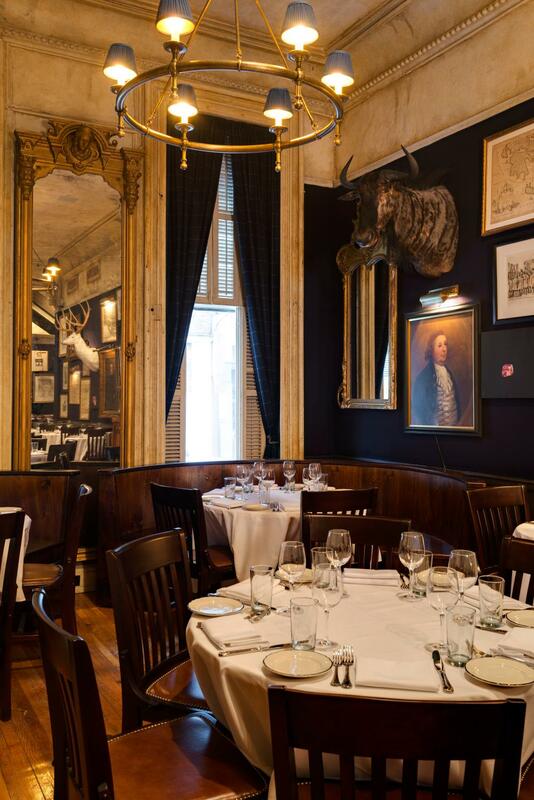 Set in a 19th-century townhouse, Bill’s was once the site of a Prohibition Era speakeasy. Listen to the pianist in the downstairs bar while you knock back a Scotch, just steps away from many of the original Madison Avenue ad agencies. You can finish the evening upstairs with a Delmonico steak for two and an aptly named Hanky Panky gin cocktail, a clubby setting for consummating a business deal (or other kind of tryst). www.bills54.com. 57 East 54th Street, 212-538-2727. 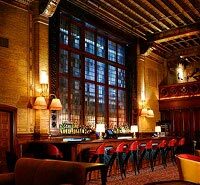 Monkey Bar: Across the street, the landmark Hotel Elysée (once known as the “easy lay”) has welcomed guests like Joe DiMaggio and Marlon Brandon. Step inside the great piano bar just off the lobby with its iconic monkey mural. You can just picture Roger downing a Manhattan or two before heading for a room upstairs. 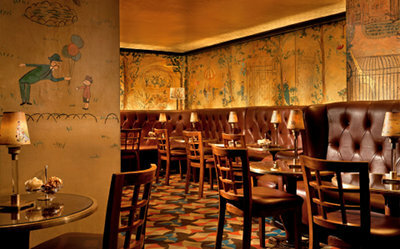 Hotel Elysée, www.monkeybarnewyork.com, 60 East 54th Street, 212-753-1066. 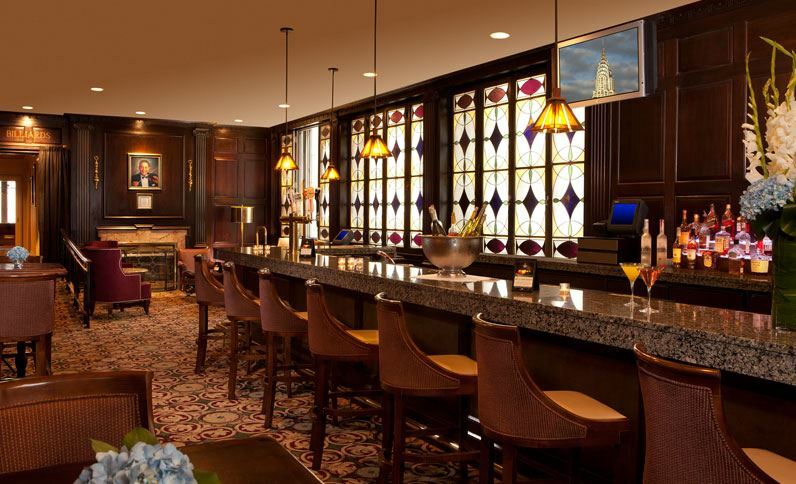 Madison Club Lounge: The historic lounge in the Roosevelt Hotel is classic Mad Men with its mahogany walls, stained glass windows, and leather bar seats. It’s likely Don began and ended his day here during the time he lived at the hotel, pouring vodka into his orange juice. 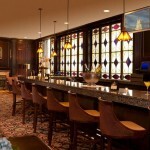 45 East 45th Street, 212-661-9600. www.theroosevelthotel.com. 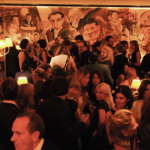 Bemelman’s Bar: Some things never go out of style. 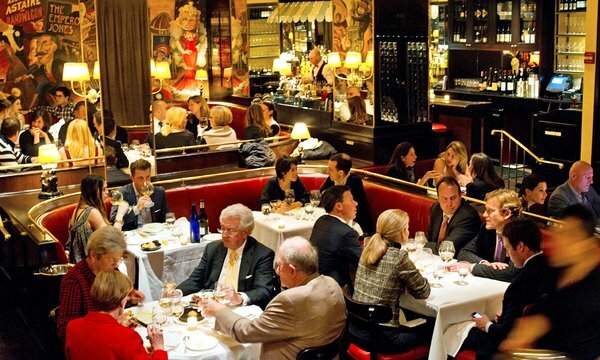 Live piano music, enchanting murals of animals by Ludwig Bemelmans of Madeline fame, plus formally dressed waiters make this an Upper East Side landmark. The perfectly chilled and poured martini comes in a shaker with enough liquor for a potent drink and a half, and the banquettes are perfect for cuddling. 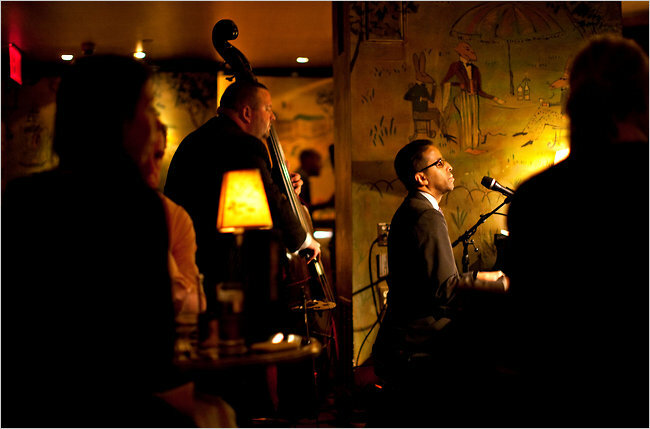 The Carlyle Hotel, http://www.rosewoodhotels.com/en/the-carlyle-new-york/dining/bemelmans-bar , 35 East 76th Street, 212-744-1600. 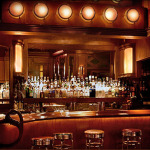 Temple Bar: The glamorous oak bar in NoHo is known for its extensive drink list peppered with all the classics. Imagine yourself sitting with Don among the beautiful velvet curtains, sipping an Old Fashioned, or with Joan indulging in a creamy Brandy Alexander. 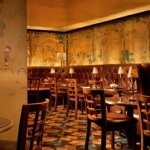 http://www.templebarnyc.com/ 322 Lafayette Street, 212-925-4242. Bill’s Food & Drink: It’s not exactly the original Bill’s Gay Nineties, but it’s pretty close. 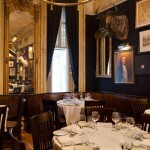 Set in a 19th-century townhouse, Bill’s was once the site of a Prohibition Era speakeasy. Listen to the pianist in the downstairs bar while you knock back a Scotch, just steps away from many of the original Madison Avenue ad agencies. You can finish the evening upstairs with an oversized ribeye and an aptly named Hanky Panky gin cocktail, a clubby setting for consummating a business deal (or other kind of tryst). 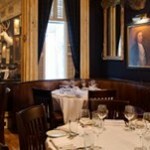 57 East 54th Street, 212-538-2727. www.bills54.com. Monkey Bar: Across the street from Bill’s, the landmark Hotel Elysée (once known as the “easy lay”) has welcomed guests like Joe DiMaggio and Marlon Brandon. 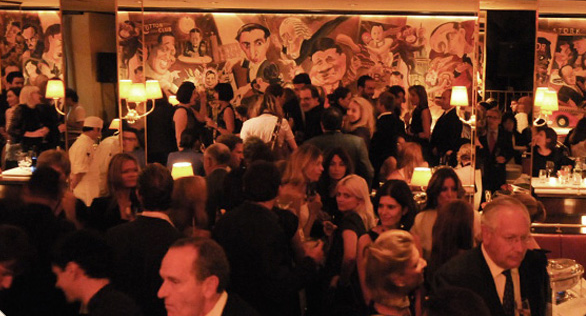 Step inside the bar just off the lobby with its iconic monkey mural. You can just picture Roger downing a Manhattan or two before heading for a room upstairs. Hotel Elysée, 50 East 54th Street, 212-753-1066. www.elyseehotel.com. 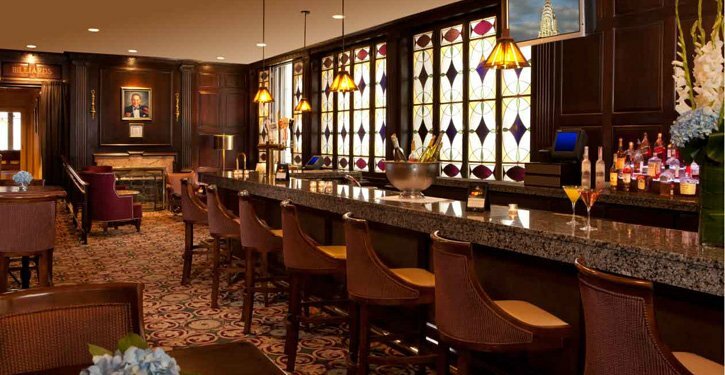 Madison Club Lounge: The historic lounge in the Roosevelt Hotel is classic Mad Men with its mahogany walls, stained glass windows, and leather bar seats. It’s likely Don began and ended his day here during the time he lived at the hotel, pouring vodka into his orange juice. 45 East 45th Street, 212-66-19600. www.theroosevelthotel.com. 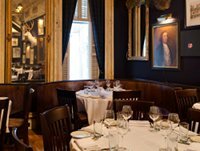 21 Club: Infamous for its Prohibition-era speakeasy status, this restaurant has attracted every president since FDR (except George W. Bush) to dine or imbibe. Come for a martini just like James Bond in 007 or try a Southside, the rum and mint cocktail invented here. It’s quiet enough, too, that Ted and Peggy could have shared a drink at the 21 without having had to escape to an afternoon Roman Polanski movie. 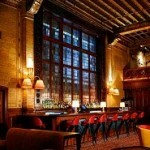 21 W. 52nd St., 212-582-7200; www.21club.com. Bill’s Food & Drink: It’s not exactly the original Bill’s Gay Nineties, but it’s pretty close. 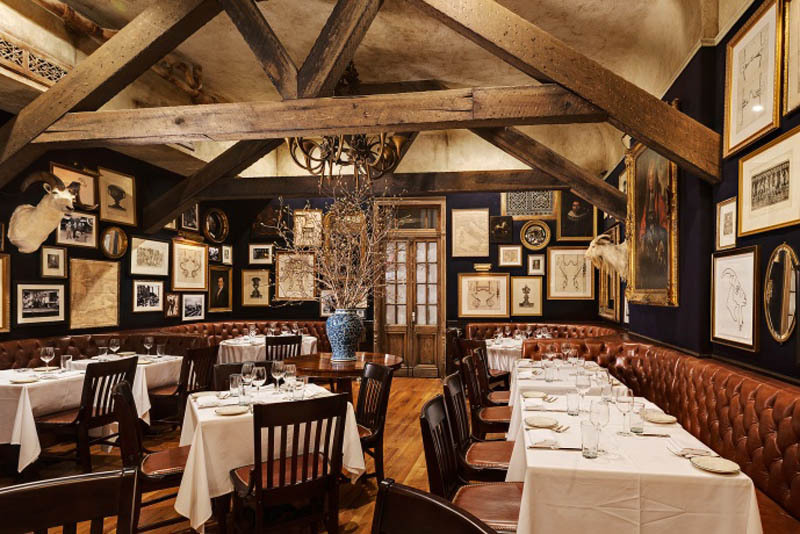 Set in a 19th-century townhouse, Bill’s was once the site of a Prohibition Era speakeasy. Listen to the pianist in the downstairs bar while you knock back a Scotch, just steps away from many of the original Madison Avenue ad agencies. You can finish the evening upstairs with a Delmonico steak for two and an aptly named Hanky Panky gin cocktail, a clubby setting for consummating a business deal (or other kind of tryst). 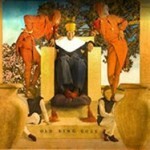 57 East 54th Street, 212-538-2727. www.bills54.com. Monkey Bar: Across the street from Bill’s, the landmark Hotel Elysée (once known as the “easy lay”) has welcomed guests like Joe DiMaggio and Marlon Brandon. 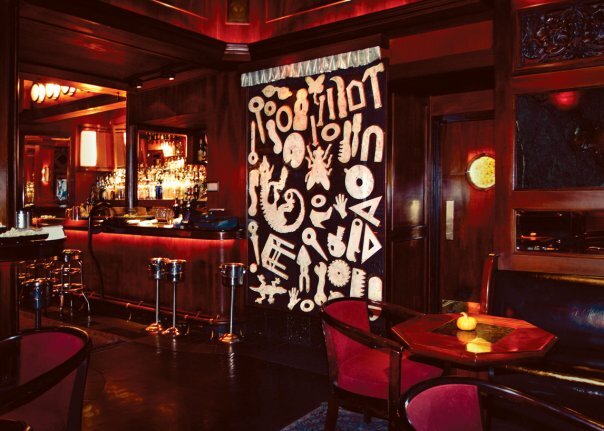 Step inside the bar just off the lobby with its iconic monkey mural. You can just picture Roger downing a Manhattan or two before heading for a room upstairs. Hotel Elysée, 60 East 54th Street, 212-753-1066. www.elyseehotel.com. 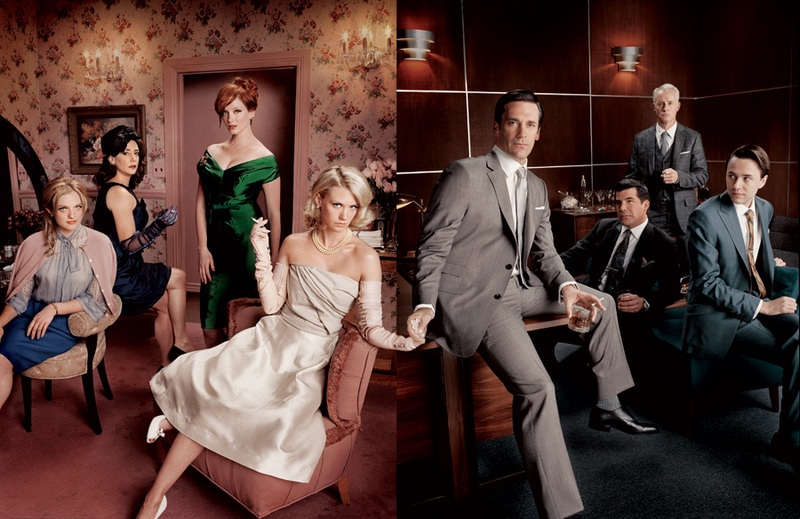 We’ve waited way too long to long to pick up with the escapades of our favorite Mad Men characters. Will Betty reconcile with Don? Will Don’s marriage last? What is Roger going to do this year (he really didn’t do much of anything at the new ad agency)? And are Joan and Peggy going to seize control from the men? The two-hour premiere of the fifth season of “Mad Men” airs Sunday, March 25 at 9pm. And where more appropriate to celebrate than in Manhattan, the heart of the Madison Avenue agency mecca?